NOTE: Click headline to view video story. ROCHESTER, Ind. -Some Hoosiers across the state are concerned that the thousands of dollars they've spent on solar panels, may go to waste. A proposed Indiana bill would change the way solar renewable energy is metered, and end up costing people the money that they thought they'd be saving. Saving money, making money. 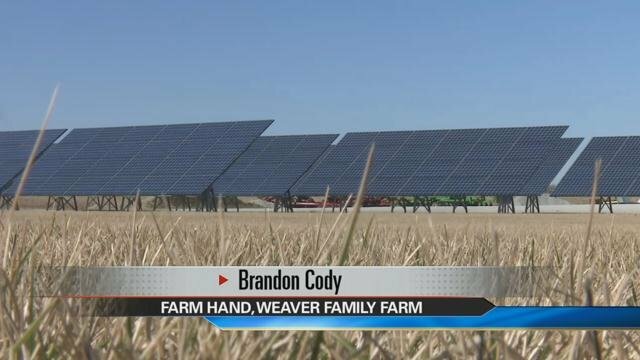 That's the reason that the Weaver Family Farm, just outside of Rochester, decided to get solar panels a few years ago. Saving money is the main reason that many opt to purchase these solar systems. Eric Straeter and his dad, Jim, of Ag Technologies, a growing solar business in Rochester, say it's an expensive investment that people are willing to make, for the payoff. "The payback on solar is about a 8-10 year period, and solar systems have a 25 year warranty. You do the math," says Straeter. "They can save big money. Tens of thousands of dollars." Proposed Indiana Senate Bill 309 would change how solar owners get their energy and spend their money. "The owner would have to sell it to utility at wholesale price, which is about four cents. And they would have to buy it back at retail price, which is about 12 cents," says Jim Straeter. It's a financial loss, that could have a domino effect. "If this bill passes, than that would more than likely deter people from purchasing the panels and using the renewable source," says Cody. That's putting jobs at risk, and concerning businesses like the Straeter's. They're already considering moving jobs across state lines in the law goes through. But it's also impacting the people who purchased the panels, making investments dim. "I think the whole point in these solar panels and using renewable energy from the sun is kind of a waste if this bill passes, and it ends up costing us more," adds Cody. ABC57 reached out to Senator Brandt Hershman, who authored the bill, and he has agreed to discuss the bill further.